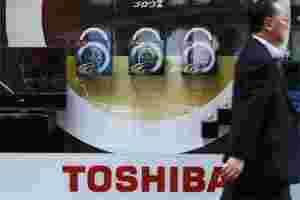 Tokyo: Toshiba Corp , Japan’s biggest chip maker, eked out a rise in quarterly operating profit on cost cuts in its PC and smartphone display businesses, and kept its earnings outlook unchanged above expectations. But the strong yen weighed on the world’s No.2 maker of flash memory chips behind Samsung Electronics , sending its core chip profits down close to 20%, even as its nuclear power business confronts regulatory delays in the wake of the Fukushima nuclear crisis. Toshiba is betting on further cost cuts as a new NAND production line comes online, and retained its annual forecast for an operating profit of 300 billion yen ($4 billion), above the ¥281 billion consensus estimate of 23 analysts polled by ThomsonReuters. Toshiba, a supplier to Apple Inc , has been helped by demand for the iPad and iPhone and smartphones using Google’s Android platform. Both rival Samsung and Toshiba production partner Sandisk hurtled past expectations on smartphone demand. Shares in Toshiba, which also competes with Hynix Semiconductor Inc in semiconductors and with GE and Areva in nuclear reactors, have fallen 19% this calendar year, broadly in line with Tokyo’s electrical machinery subindex . Its shares closed down 3.9% prior to the announcement, underperforming a 1% fall in Tokyo’s electric machinery subindex.